Full-season team projections cause some heated arguments. If a team finishes the year with fewer wins than expected, fans want to know why their club underperformed projections. If a team overperforms its projections, meanwhile, those same fans will insist that forecasts in subsequent years lack the ability to detect their club’s particular strengths and are thus useless. Here at FanGraphs, we have only been doing full-season projections for a couple years, but just about every week I see a mention of the 2015 World Champion Kansas City Royals’ projected record of 79-83. If I search Google for “79-83 Royals FanGraphs,” I get over 11,000 article links. Unsurprisingly, it’s a popular topic. Rarely does a club, following a pair of World Series appearances, then proceed to fail to break even. But that’s what the numbers suggest for 2016. 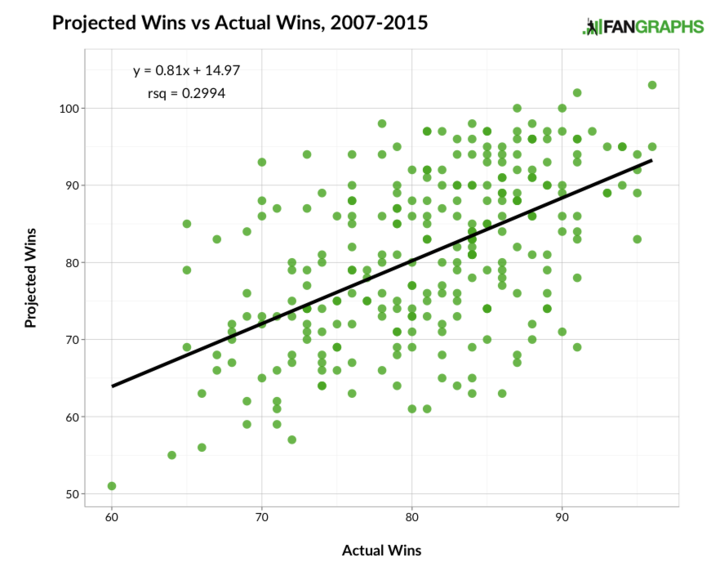 While FanGraphs has produced team win projections for only a couple seasons, Replacement Level Yankee Weblog (RLYW) has been publishing win projections for years. Since 2007, to be precise. Given this larger sample, I thought that it might be worthwhile to compare the projected win values produced by RLYW to the actual final win values produced by teams. So, with the permission of RLYW editor SG, that’s what I’ve done here. I hate to disappoint anyone, but there are actually aren’t any great findings in the plethora of graphs to follow. I did find a couple interesting artifacts of the data, but no game changers. Instead, I see the following mainly as an additional data point in many past, present, and future discussions. To start with, here is how projected and actual values have correlated. You smell that? It’s baseball’s prospect-list season. The fresh top-100 lists — populated by new names as well as old ones — seem to be popping up each day. With the individual rankings coming out, some organization rankings are becoming available, as well. I have always regarded the organizational rankings as subjective — and, as a result, not 100% useful. Utilizing the methodology I introduced in my article on prospect evaluation from this year’s Hardball Times Annual, however, it’s possible to calculate a total value for every team’s farm system and remove the biases of subjectivity. In what follows, I’ve used that same process to rank all 30 of baseball’s farm systems by the surplus WAR they should generate. I provide a detailed explanation of my methodology in the Annual article. To summarize it briefly, however, what I’ve done is to identify WAR equivalencies for the scouting grades produced by Baseball America in their annual Prospect Handbook. The grade-to-WAR conversion appears as follows. To create the overall totals for this post, I used each team’s top-30 rankings per the most recent edition of Baseball America’ Prospect Handbook. Also accounting for those trades which have occurred since the BA rankings were locked down, I counted the number of 50 or higher-graded prospects (i.e. the sort which provide surplus value) in each system. The results follows. This past Saturday, I was collecting some first-hand accounts on a few players at the NBC World Series in Wichita, Kansas. The NBC World Series brings in some of the top teams from various college summer leagues for a double elimination tournament. On Friday, I was up until 2 a.m. watching the final Friday game and then at the stadium for the 8 a.m. game. During the day’s third game (Liberal Bee Jays vs San Diego Force), a play was just finishing, when I heard the sound that resonated throughout the stadium. The on-deck batter was taking a warm-up swing and hit the team’s bat boy in the head. While I didn’t see the actual contact the Bee Jays’ player made with their bat boy’s head, I saw the last few steps the boy made in his short life. He stumbled twice and then fell to the ground. Then chaos ensued for a few minutes. The player who just hit the boy was holding the lifeless body in his arms. The boy’s mother was screaming as she jumped on the field. The home plate umpire immediately began to administer first aid. During this whole time, I never saw the little guy move. Last year, I revisited Mike Fast’s “Lose a Tick, Gain a Tick” article and found how much a pitcher should expect to see his ERA, FIP and xFIP change with a velocity decline. Additionally, I found the rate of decline of strikeouts and walks. An interesting finding from the work was that FIP and ERA change by the same amount with a velocity decline while xFIP doesn’t follow the other two. I decided to examine some batted-ball stats to see which ones change when a pitcher’s velocity changes. Which Defenders Make the Plays They are Supposed To? Defensive statistics have been open to debate since they were first created. This back and forth probably will continue on for years to come, even with some new technologies offering the promise of better data. One limitation with giving individual players values for their defensive metrics is positioning. The player’s coaches may have them completely out of position for a seemingly routine play and zone based metrics are going to downgrade the player because they didn’t make the play. While it may be impossible to know the correct player position before each play, the chances of a defender making a play knowing their initial position can be estimated with Inside Edge’s fielding data. By using their Plays Made information, I will add another stat to the defensive mix: Plays Made Ratio. The concept is fairly simple. Inside Edge provides FanGraphs with the number of plays a defender should make given a range of possible chances. Inside Edge watches each play multiple times and grades the difficulty of the play. Here is their explanation for how they collect the data. Inside Edge’s baseball experts include many former professional and college players. Every play is carefully reviewed, often more than once. It is not uncommon for IE scouts to review certain plays together in order to reach a consensus on the defensive play rating. IE also performs a thorough post game scrubbing process before the data is made official. Did Bumgarner and Shields Throw Too Many Pitches? Madison Bumgarner pitched quite a bit this past season. Including the regular and post season, he threw a total of 4,074 pitches, which wasn’t even the season’s top total; James Shields bested him by throwing six more, for a total of 4,080 pitches in 2014, not including spring training. So with all of the pitches thrown this season (and one month less of rest), how should we expect these two to produce next season? Let’s look at some comparable pitchers. Since Alex Gordon moved into first place in position player WAR (although he’s now second again), quite a bit of back-and-forth discussion has occurred on if he is this season’s best position player. Most of the talk revolves around how much stock should people put into defensive statistics. Our own Dave Cameron has already taken a stab at the subject earlier in the week. Alex Gordon is getting close to two wins of value from his defense, a considerable jump from his previous seasons. After looking at the inputs used for UZR, it is not Alex Gordon’s performance going to new levels, but the lack of talented defenders in left field making him seem better. A few weeks ago I noticed hitters no longer improved, but instead their production only declined as they aged. Additionally, I answered at few questions on the first article in a second article. Today, I am going to look at the individual hitter traits to see which ones may be leading to the early decline. First off, I will start off with some disclaimers. A few days ago, I looked at the possibility of major league hitters no longer showing any hitting improvement, on average, once they debut in the majors. I believe both the banning of PEDs and teams being able to evaluate MLB ready talent are the keys to this change. For years it’s been assumed hitters will get to the major leagues and peak offensively around age 30. Teams and fans can hope the new, shiny, 20-home-run-hitting rookie will improve over time and someday will hit 30 to 40 home runs. Hitters were expected to improve until their late twenties and then begin to decline. But recent data show there’s no longer a hitting-peak age. Instead, hitters arrive at their peak and simply decline with age. I pretty much stumbled on this finding a few days ago. I created an stolen base aging curve for Mike Podhorzer and then created one for home runs. I separated the data into pre- and post-PED ban eras, the latter of which happened between the 2005 and 2006 seasons. It didn’t surprise me to see a slow decline in the home run curve during the PED era. My biggest surprise was the post-PED data where home runs no longer peaked, they only declined. I examined just about every overall offensive stat (OPS and wOBA, to name a couple) and found the same thing: Hitters no longer peaked, they only declined. 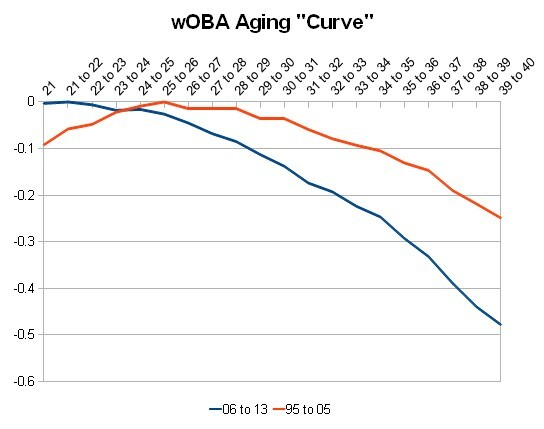 Here’s a look at the wOBA aging curve from pre- and post-PED ban eras, along with a note on how the curves were created. … survivor bias, an inherent defect in the delta method, which is that the pool of players who see the light of day at the end of a season (and live to play another day the following year) tend to have gotten lucky in Year 1 and will see a “false” drop in Year 2 even if their true talent were to remain the same. This survivor bias will tend to push down the overall peak age and magnify the decrease in performance (or mitigate the increase) at all age intervals. For 20 seasons, hitter production began to decline significantly around age 30. Over the past seven seasons, the decline has occurred immediately. A problem exist when using wOBA in the recent lower scoring environment. The league wOBA in 2006 was .337, and in 2013 it was at .318. That’s a drop of 19 points in seven seasons, or 2.7 points per season. Players will have the appearance of aging from season to season. Hitting (wOBA) has been on the decline for several reasons. Teams have been better at evaluating players’ defense abilities and deploying better defensive alignments in the field. Also, the quality and quantity of hard-throwing relief pitchers has increased across the league. Finally, 2006 was the first full season with the harsher PED punishments (from 50-game suspensions to 100-games suspensions t0 lifetime bans). This overall decline leads to a large year-to-year aging factor. The recent decline in offense led me to create aging curves with wRC+, which is weighted to the season’s, the league’s and the park’s run-scoring environment. I ran the aging curve to look at four, seven-year time frames. 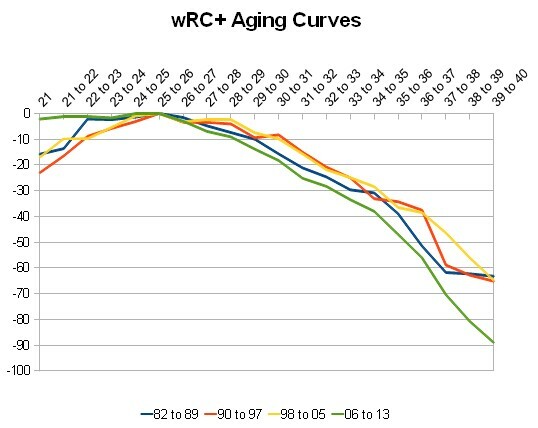 With wRC+, the most recent aging curve doesn’t immediately begin declining like the wOBA curve. Instead, it remains constant until it begins to decline. The decline starts at the same point when previous players began declining (between age 25 to 26 season). The curve shape is the same for pitcher aging curves: no up and down, just constant and then down. Additionally, the most recent rate of decline is almost the same as the pre-PED aging rate (82-89). This information is important in predicting young players’ performance. Once a hitter makes it to the majors, he doesn’t really improve. In the past, people used to hope for improvement and growth as the player aged. These days, people should expect to see the player performing at his career best immediately. This trend of contributing right away may have been occurring before 2006. The uncontrolled use of PEDs may have masked the lack of an up and down curve. Players were improving chemically past their previous peak and were able to maintain their performance over time. For years, pitcher performance declined as those players aged, but hitters seemed to have an up and down performance curve. In the past few seasons, hitters no longer improve once they arrive in the majors. Instead, their performance is constant until they begin to decline, which, on average, is at 26 years old. Improved training and development is probably behind the shift. If fans are hoping for a young position player’s performance to peak, they might be sorely disappointed. Chances are the player is likely producing at his career-best already.